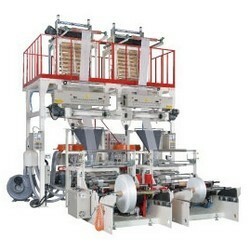 HSIN LONG THREAD ROLLING MACHINE CO., LTD.
AUTO LOADER. GRAVIMETRIC DOSING UNIT. LD/LLDPE DIE HEAD & AIR RING. ROTARY UNIT. BUBBLE CAGE. WIDTH CONTROLLER. OSCILLATING / VERTICAL TAKE-UP UNIT. EMBOSSING DEVICE. SURFACE TREATER. CHILLER. EDGE POSITION CONTROL. BACK TO BACK WINDING UNIT. ELECTRONIC TENSION CONTROL. HEAT SLITTING DEVICE. AIR SHAFT.